Last year, Shakuntalam studio (One of the city’s biggest Postproduction studio) started a new venture named “Shakuntalam Theatre”. Centrally located; it is the only mini auditorium (Seating Capacity: 50 people) which garners large number of audience staying around Mumbai’s western suburb stretch from Borivali to Juhu. Shakuntalam Theatre Festival is the brainchild from the cumulative aspirations of NSD alumni pass outs to stage plays and promote professional theatre by providing a well-equipped theatre space. Since its foundation, the theatre have staged many plays namely “NOY” directed By Subrat Dutta (36 NSD pass outs Actors), “Bada Bhand” directed By Ajay Kumar (12 NSD pass outs Actors & Musicians), “Hum Bihar Mein Chunav Lad Rahe Hai” (13 NSD pass outs actors & singers), “Bade Bhai Sahab” actor Harish Shankar and “Reechh – The Bear” directed By Shakeel Sayani & many more including Shakuntalam Theatre’s own production – Directed by Rajesh Tiwari “Karturba”& “Pari”. Shakuntalam theatre has a commendable achievement of participating in an international project hosted by UNESCO. The play “Nisargam Abhimancham Natyashastram” scripted, designed and directed by Mahesh V Patil will be representing our country on an international platform. 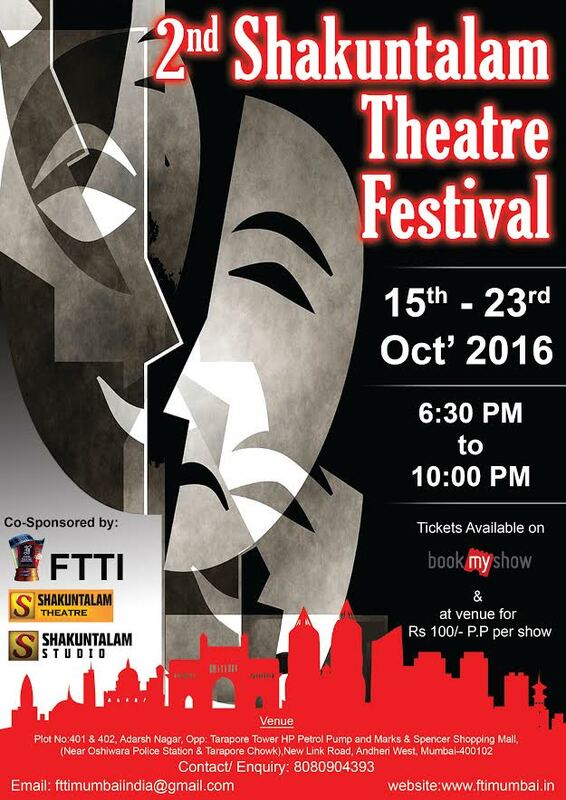 Last month (September) the theatre had organized its 1st theatre festival – “1st Shakuntalam Theatre Festival” in association with FTTI, Mumbai. Drama troupes from 21 productions participated in the festival. More than 400 people attended the festival. To mark their one year completion and to celebrate the success of their previous & first theater festival, Film Television and Theatre Institute (Mumbai) & Shakuntalam Theatre have organized a 9 days theatre festival in Mumbai. With the end of a grand annual festival “Dussehra” and to mark the beginning of autumn season, this festival comes as a boon to relax the Mumbaikars from their daily hustle and bustle. Situated in the entertainment hub of the city – Andheri west, its proximity, connectivity and primary location serves as a major ease to theatergoers. Festival site also provides ample parking space which is absolutely free located right next to the theatre. The theatre has been visited by famous personalities like Ram Gopal Bajaj, Kamalakar Sontakke, Raghubir Yadav, Mukesh Tiwari, Mandakini and Govind Namdeo. Others, who marked their presence includes renowned theatre personalities like Ajay Kumar, Vijay Kumar, Subrat Dutta, Alok, Asima Bhatt, Vibha Chibber, Rajesh Jais, Vivek Mishra, Seema Azmi, Joseph Mungra (USA Best Awarded Director), Best Sound Recordist Kale. Organizing their 2nd theatre event, this festival will witness 12 different plays, performances by around 40 versatile actors (NSD & Non NSD) and a minimum expected audience of around 1500 people. With the presence of popular and renowned theatre personalities like Ashok Bhantia & Aashique Hussain ( both NSD Pass out), this theatre festival will be a great treat for the theatre lovers of Mumbai. Ashok Bhantia will be directing & acting in “Lomdiya”, while Aashique Hussain will be solo performing in “Shaadi Kara Do Baba” which is written and directed by Aashique Hussain himself. Renowned celebrity Rozlyn Khan will be seen in “Hatak” playing the lead character. We are hoping for best response and looking forward to organize more such theatre festivals. Our next venture is 1st India International Film Festival, Equal Streets Free Participation Event at Lokhandwala on every Saturday & Sunday morning. Also adding another feather to our cap is our most prestigious, upcoming and one of its own kind Film Television & Theatre Institute’s courses which will provide internships, fellowships & scholarships to 40 aspiring students. VENUE: Shakuntalam Theatre, Plot No. 401 & 402, Opp. Tarapore Tower HP Petrol Pump, near Marks & Spencer , Adarsh Nagar, Andheri West, Mumbai – 400102.